Bowflex designed the TreadClimber to give you a good cardio workout at a walking pace and with lower impact. In fact, their trademarked tagline for it is 'Just Walk'. How is the TreadClimber different from other cardio machines? 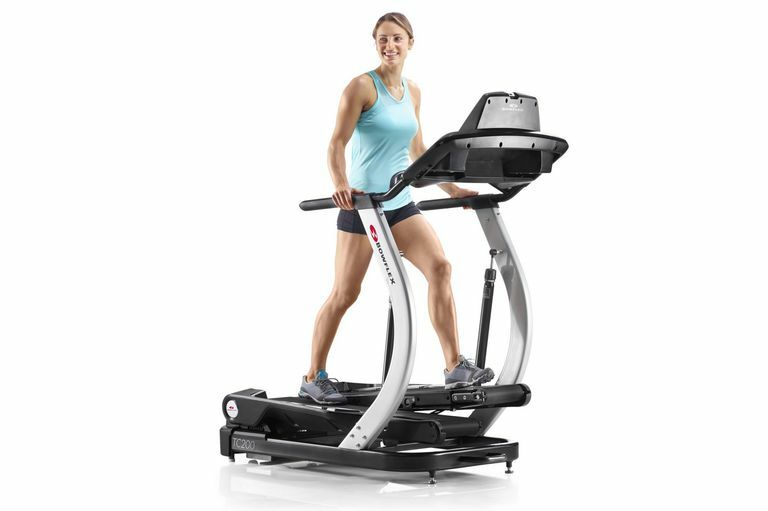 The Bowflex TreadClimber combines the actions of a treadmill, elliptical and stepper. All you do is get on and walk. The split tread moves at walking speeds and responds to each step with an up/down motion. The result is similar to walking in sand - you get a great low-impact workout which raises your heart rate to the moderate to vigorous exercise zone. But you are walking at surprisingly lower speed while getting that cardio workout. This action also gives you more of a core workout, especially if you walk without gripping the console or handrails. Who Should Use a Bowflex TreadClimber? The Treadclimber is great for those of us who only want to walk and who want a low-impact workout. If you have hip or knee arthritis, the low impact design is better than a traditional treadmill or walking outside. Lower speed and impact does not mean low heart rate, the TreadClimber will get your heart pumping at a lower speed. It is very simple to use, without unnecessary complications. The Treadclimber also takes up less space than a traditional treadmill. Bowflex has produced TreadClimber models for several years and they were favorites in our Reader's Choice Awards for treadmills. The TC200 is an updated design. Four User Profiles: Customize your workout by setting up a user profile. This will give you the most accurate calorie-burning data and heart rate data. You can set up profiles for four different users. Low-Impact Cushioning: First, you set the cushioning action of the treadles. Each tread has its own adjustment, so if you need more cushioning on one side or the other you can do that. The more up/down motion for the treadles, the lower the impact and also the more effort you will put into each step. There is no incline adjustment, although by changing the cushioning you will change that up. Workout Programs: Select from five workout programs. You can select Just Walk or a Calorie Goal workout, Time Goal workout, or Interval workout. With the interval workout, you will get cues as to when to increase the speed or slow it down, but it doesn't do that for you. This is a safety feature, so the machine doesn't do anything you weren't expecting. Speed: You now adjust the speed with buttons to raise it in 0.1 mph or 0.5 mph increments. This lets you fine-tune the speed. You will discover that you are putting in a significant effort at relatively lower speeds. We normally walk at a 3.5 mph pace and felt a great workout at 2.5 mph on the TreadClimber. The speed is adjustable from 0.5 mph to 4.5 mph, so you can see that you don't need to run, this is built for walking. Heart Rate: You can monitor your heart rate and see which zone you are in by using either the heart rate grips or the included heart rate chest strap. A light bar lights up in different colors to show you which zone you are in. Calorie-Burning and Motivational Display: While you workout, little leaf-like dots accumulate on the display, each indicating a calorie burned. It's mesmerizing to see them build up a design, and I find it quite motivational. As you workout, you also get trophies for starting a workout, achieving milestones and achieving goals. TreadClimber App and Bluetooth Connectivity: Use the free TreadClimber app to track your workouts. After a workout, sync the data to the app. It will keep track of four different users. It can share your workouts with MyFitnessPal, Apple Health Kit, and Google Fit. Smart Design with Tablet Holder, USB Port: The top of the console is designed to securely hold your tablet or mobile phone and to plug it into a USB power port. You can stay connected and watch your own videos and listen to your own music while working out. There are also good drink holder areas on each side of the console so you can stay hydrated. The TreadClimber TC200 is rated for users up to 300 pounds. It takes up less space than most treadmills, but it doesn't fold up. We prefer walking outdoors, but we really appreciated the workout we could get with the TreadClimber TC200 at a walking pace. At lower speeds, we can just enjoy a stroll, but taking it up to what would still be a low speed outdoors produces a great higher-heart rate workout. My husband liked the low-impact workout he got, which was much better for his hip arthritis. At first we wondered whether we'd miss having all sorts of fancy workouts included, but frankly, it was great to just get on and Just Walk. We entertained ourselves just fine with iPads while walking. After a couple of weeks of using the TreadClimber review unit and avoiding walking in cold, icy and wet winter weather, we bought one. A good selling feature is that it is shorter than most treadmills, so it fits into our office space. Can Slow Walking Help You Lose Weight?